Saunas | Bavarian Cottages Ltd. So you are looking for a sauna. Why buy from us you ask? Well as you will see in your search for the perfect sauna, many of the kits out on the market don't have our features and most importantly, We Are Affordable, and that's the only way you can take advantages of the healing properties of a sauna; you have to be able to own one. Ready to go without first building walls permanently into your home. This means you have to hire someone if you are not able to do this type of work and that leads to additional costs and hassle. Add to this fact that you cannot easily take their saunas apart and take them with you, they make a poor choice for the average person who may eventually relocate and want to take his or her investment with them. Make for affordable outdoor Saunas. The vast majority of the saunas on the market are not affordable or even practical. Most saunas are built for either indoor use or outdoor use. Why choose when you can have both. Read on and you will see the only convertible sauna like this on the market. You may have seen this term associated with a sauna. Well here's a first... what if you could buy an inside sauna but could convert it for outside use easily in just a short time with little money. Wouldn't that be great? Well here is an industry first. With our saunas, you can do just that. If you move and you don't have room inside you can convert it for the back yard. If you want to sell it down the road should you find yourself in a position where you don't have room, it's no longer a problem. So you want a Pool Cabana with an inside sauna built into it, or maybe you want a storage shed with a sauna built into the backside, what about a shower room with a sauna in it. You name it, we can custom design it specifically for you. These kits are among the easiest to build anywhere. If you have played with building blocks as a kid, you are well on your way to being able to build one of these for yourself. Here's one of our most affordable outdoor saunas. This little cutie will dress up any yard and is sure to draw some real attention. 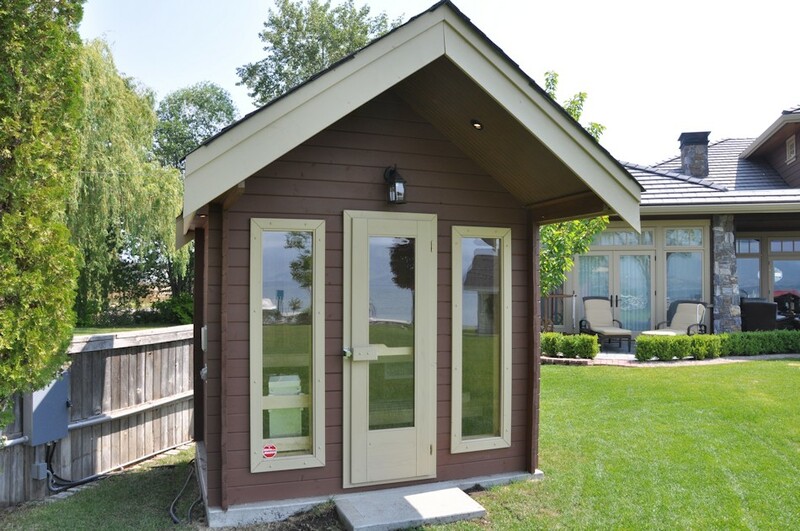 Unlike most outbuildings, this one beautifies your yard while you use it. 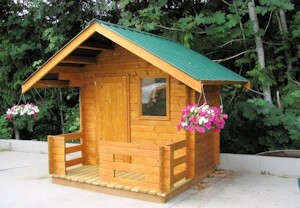 Sauna room : 8ft x 5'"
Main door : 32" x 75"
Front window : 22" x 30"